Just yesterday we told you about a Lost Planet spin off called EX Troopers that was confirmed for 3DS. We're already learning more about the game, including the fact that it's actually called E.X. Troopers, and that when Capcom teased an anime style, it wasn't kidding. The E.X. Troopers official web site has been launched which includes information, in Japanese of course, on characters and items, as well as a trailer. The trailer shows off the graphics style and also the 'school' setting which your character occupies. There's a jet-pack, of sorts, various weapons and some snazzy mech-robots involved; while this is probably PS3 footage, we'd suggest that 3DS is capable of these kind of visuals, though we shouldn't assume anything. The trailer is below and gives a good flavour of what this title is all about: would you be interested in a Western release? 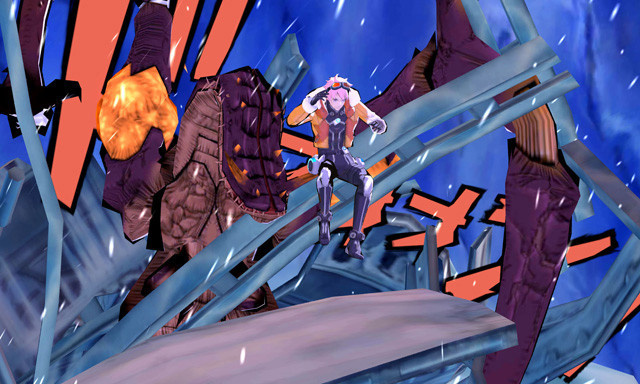 E.X Troopers trailer looks completely awesome but i really want to see the 3DS game-play footage. I would totally be up for a state side release. I'm not really a Lost Planet fan but the spin-off looks much better then the original games. artstyle and music are fantastic! bring up the western release ! I'm on board, I love the aesthetic. I just hope it plays better than average so I can justify the impulse buy. Then again, I hope I 'm wrong and it rocks my socks off. Looks cool, but until I saw the Arkids, it looked nothing like even a spin off of Lost Planet. totally agree with you ! the ps3 is capable of way beyond that, but if its on 3ds, then its great ! until smash brothers at least. ill keep it on my radar! Not for me afterall. Don't like these type of anime, cartoony looking games. I'll wait for a real FPS or TPS hopefully for the holidays. COD 3D anyone? @Gustoff Black ops II 3D would be legendary!!! The guy has pink hair. Maybe as a $15 PSN game but I can't picture that selling on PS3 retail. It kind of reminded me of Spectrobes on both the Wii and DS. That's not a good thing. I haven't played the Lost Planet games but I did play 1 or 2 demos and I don't see the connection. Looks more like a ZOE spinoff. Looks good. I like Anime themed titles after all. Yes it would, yes it would indeed. This is right up my alley. I'm such a sucker for all this over-the-top anime crap. I'll be checking out the 3DS and PS3 versions together! This is a Nintendo 3DS footage. The 3DS is the lead platform for EX Troopers. I don't care for the lost planet series but this looks awesome! I hope it gets a western release. On second thought, it looks like it might be similar to the Phantasy star online/portable games so maybe its not for me then. this looks amazing. i would difinately buy if it came to the NA. (please release overseas!!!!) i wanna play this for 3DS. That was pretty weird, but I saw a space ship and a giant mech, so I'm pretty much guaranteed to buy it now. @rjejr What in the world reminds you of Spectrobes? Hmmm.... is that partners who accompany you I see? Echoing what @6ch6ris6 said, these graphics look rather weak for a PS3 game. But then, they look pretty phenomenal for a 3DS game. I think I need to see more, that trailer didn't really impress me didnt look bad but it didnt look good either. Looks interesting! But has this anything to do with Lost planet? Because I remember it to look much more western!! Backgrounds look a little bland, but I love the character designs, colour me interested. Lost Planet is not Gundam, it's not evangelion, it's not Zone of the Enders. There are a lot of bad choices shown in this trailer imo. Overall I'm not happy with this. The 3D jumps from panel to panel are interesting though. This must be Capcoms way of getting revenge on Lost Planet creator Keiji Inafune for all the things he's said about Capcom and the Japanese gaming industry as a whole. I hope you can customize your main character--I'd hate to battle it out in frozen tundras wearing a light jacket and sunglasses. Also his hair is... pink. Yeah,...pink hair...sigh, Japan...it's not funny anymore! What's wrong with natural colours? Notice also that in ground combat you never see the hero in a VS, "Vital Suit", (Lost Planet talk for mech-suit). I've always wanted a Lost Planet game on a Nintendo console or handheld so I'm all for this coming stateside. Looks awesome and Capcom bring Lost Planet 3 to Wii U!!!!! From the picture i thought this is going to be abysmal but the trailer was kinda intriguing. Looking forward to it.